Miguel Almiron is confident that he won’t be bullied off the ball in the Premier League. The slightly-built midfielder signed from Atlanta United for a club-record £21million fee last week. Almiron, unveiled to the media yesterday, hopes to make his debut in Monday night’s Premier League game against Wolverhampton Wanderers at Molineux. The 24-year-old – who was English football’s most expensive signing last month – believes that he can quickly adjust to the physicality and intensity of the Premier League with help from manager Rafa Benitez and his team-mates. “In terms of the pressure and pricetag, I don’t pay too much attention to that – my focus is to learn from the manager and team-mates,” said the Paraguay international. Almiron, having long watched Premier League football, is expecting a “tough” introduction to the English game. “It’ll be quite tough,” he said. “There are big differences in the two leagues. The tempo’s different – it’s higher tempo and more pressing. Meanwhile, Benitez will take his players to Spain for a five-day training camp after the Wolves game. 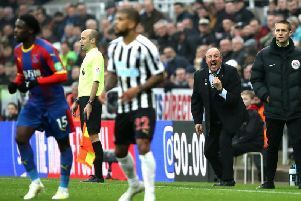 Newcastle played Royal Antwerp at the stadium over three 45-minutes periods during a 21-day fixture break in March last year. United are 15th in the table, and two points above the relegation zone, ahead of the Wolves match.